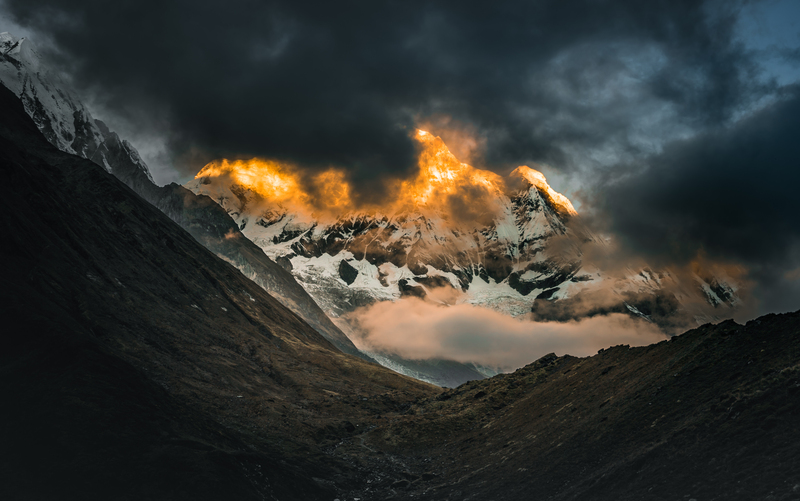 Eye of the mountain aka sunrise lighting up 8000+ meter high Annapurna South in Nepal. One of the most amazing sights I have ever seem was to witness sunrises over enormous mountains in Annapurna region in northern Nepal. The sun lights up the mountain tops about 06:10 AM and they literally glow like gold in arid and deserted landscape. This photo is shot on a way from Maccapuchre basecamp to Annapurna Basecamp in 4000 meters above sea level. Tip: The best weather for trekking in Nepal is from October to late November and from March to April when the sky is (or should be) very clear and best for the views.